It wasn’t a pretty game to watch, but the Bears got their first road win since 2015 behind an impressive effort by the defense. Baltimore had no business being in the game, but managed to push it to overtime after an impressive series of self-inflicted mistakes by the Bears in the fourth quarter. Still, the Bears found a way to get Mitchell Trubisky his first career win and improve to 2-4 on the season. Let’s look at some key takeaways from the game. The Bears continually put their offense in position to fail. There’s no other way for me to say this. They continually run the ball with predictable plays against 8-9 man boxes, which is why their running backs averaged less than 3.5 yards per rush. This led to a number of 3rd and long situations, which was about the only time they actually let quarterback Mitchell Trubisky throw. It seems to me like 3rd and long pass attempts is not a great way to build your rookie quarterback’s confidence and get him into a rhythm. The offense continues to be far too predictable. 1st and 2nd down are almost always runs, regardless of the defensive look. They never run out of shotgun, and rarely pass out of heavy sets. 90% of Tarik Cohen’s carries come to the outside. That leads to a lot of plays where the defense knows exactly what to expect, which is a death knell in the NFL. With that said, credit offensive coordinator Dowell Loggains for a beautiful trick play that led to the first offensive touchdown. Tarik Cohen took a pitch, stopped, and heaved a 21 yard touchdown pass to tight end Zach miller, who was wide open in the end zone. That’s the second week in a row the offense pulled off a successful trick play. Now if only the other 99% of his play calls weren’t terrible. Chicago’s personnel usage continues to be baffling. Their best pass catchers are Kendall Wright and Zach Miller, but both are playing limited snaps. The reason they’re not playing is that there are better run-blocking options, but sooner or later you need to give your quarterback somebody to throw to. Given all of this, it’s difficult to evaluate Mitchell Trubisky’s play at quarterback. The coaches are basically not letting him play the position, and are putting him in position to fail when he does. He only had 16 pass attempts, plus 4 sacks and 4 scrambles for a total of 24 plays where he was asked to do anything other than hand off. Several of those were screens, which are basically extended handoffs, and Trubisky had to throw it away several more times. You saw Trubisky’s physical skills with some nice throws down the field, including a pressured bomb on the run to Dion Sims for a touchdown, and some impressive scrambles. He also saved a Baltimore touchdown by corralling a bad Cody Whitehair snap in the end zone, breaking a tackle, and throwing the ball away. You also saw the inexperience as he had trouble from inside the pocket. Trubisky’s only turnover on the day was a fumble when he was hit from the blind side after somebody whiffed on a block. I don’t think you can pin much of that on the quarterback. I had all that about Trubisky written up before OT. Now I have to add a separate point for the outstanding pass he made to Kendall Wright to put Chicago in FG range in overtime. He was forced to throw on 3rd and long after two stuffed runs (surprise surprise), and Baltimore brought the heat. Trubisky avoided the first rusher and made a beautiful pass to Wright for the first down. That is a big-time play that not very many NFL quarterbacks can make. A game plan like this does very little to develop your rookie quarterback. 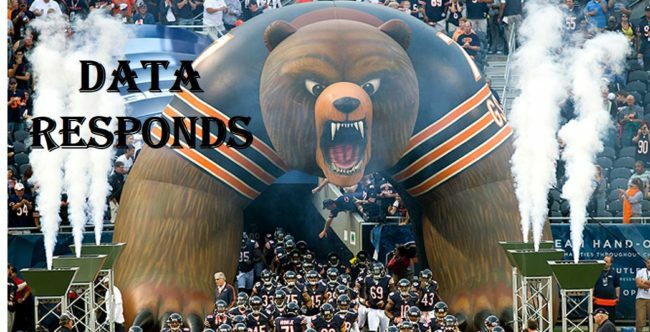 It feels like the Bears need to take the shackles off and let him make mistakes and grow, but a win is a win. Speaking of bad Cody Whitehair snaps, what gives there? He had several more today, continuing a season-long sophomore slump. At first, he had the excuse of bouncing around between guard and center, but he’s been squarely at center now for 3-4 weeks in a row and has no excuse left. Jordan Howard had an outstanding day, with 36 carries for 167 yards. He was able to pick up some yards despite consistently pounding into a stacked box, showing his trademark patience and vision and running through tackles. He also put the team on his back in OT with a 53 yard burst after breaking a few tackles near the line of scrimmage. I can’t help but imagine what he could do if the defense respected the Chicago passing game. Of course, Howard did have a boneheaded play at the end of the 4th quarter, where he ran out of bounds on 3rd and 20 to stop the clock and force Chicago to punt instead of letting the clock run out. It was shades of Marion Barber from 2011, but thankfully the miscue didn’t hurt the Bears this time. Let’s also give a special incompetent shout-out to Chicago’s 2 minute offense at the end of both halves. In the 1st half, they had 1st and 10 at the 35 with 2:07 to go and two time outs left. Predictable run, predictable screen (which Trubisky had to ground since Baltimore was so ready or it), sack, and the Bears had to punt after -9 yards in only 27 seconds. That left Baltimore enough time to get points before the half. Then in the 4th quarter, they got the ball with a tie game at the 25 yard line, 1:37 and two time outs left. The first play was a running back screen to the middle of the field, then a bad snap, then a sack, then a run out of bounds instead of running out the clock. That’s poor coaching and poor execution, a killer 1-2 punch. Chicago’s defense didn’t give up any points (or even a first down) on the first drive today. That makes the second fast start for the defense in a row, which has been a consistent problem for them under this regime. Unsurprisingly, they’ve been able to stay competitive in both games. Another consistent problem for Chicago’s defense under these coaches has been an inability to force turnovers, but that was not an issue today either as they took the ball away from Baltimore three times. On the first, linebacker Christian Jones caused a fumble, which Danny Trevathan recovered. On the 2nd, safety Eddie Jackson forced a drop with a hard hit, and Bryce Callahan was able to come down with the interception. The third and final turnover was forced by a Kyle Fuller deflection; safety Adrian Amos took advantage with the easy interception, which he returned for what seemed like a game-clinching touchdown. With an offense that struggles to score points, the defense needs to make big plays like that week in and week out. DE Akiem Hicks continued his monster season with several big run stops and a sack. He’s now up to 5 sacks on the season, and is on pace to hit double digits, an impressive feat for a 3-4 defensive lineman. Hicks didn’t get enough national recognition for his breakout season last year, but he absolutely should be in the Pro Bowl (and possibly an All Pro) if he keeps this up. Rookie safety Eddie Jackson had another solid game, but he did have one horrible angle that allowed Baltimore to break off a 30 yard run. Still, he broke up a few passes and had solid tackling in other situations. Jackson has already established himself as Chicago’s best safety. Cornerback Kyle Fuller also continued his bounce-back season with an outstanding game. He provided solid coverage throughout the game, including three straight targets in the end zone that Baltimore was unable to complete, and laid out several defenders with big hits. Fuller was also consistently around the ball, logging 3 passes defensed and tipping a ball to Adrian Amos for an interception. 2nd year safety DeAndre Houston-Carson got a few defensive snaps today as a 3rd safety. I’m surprised that came ahead of Deon Bush, and will be something to watch going forward. It was an ugly day for the special teams, as they gave up not one but two touchdowns. The first came after Chicago had just scored to go up 17-3, and Ravens return man Bobby Rainey hit the ground after being tripped up by his own blocker. All the Bears stopped, assuming he was down, but Rainey got up and ran for an easy touchdown to get Baltimore back in the game. Then they gave up a long punt return touchdown where nobody even got close to return man Michael Campanaro. That’s just inexcusable incompetence. Punter Pat O’Donnell had himself quite the game, at least in regulation. He repeatedly pinned Baltimore inside their own 20 when given the chance, and flipped field position in the 2nd half with a booming 67 yard punt. he then shanked a 33 yard punt in OT, giving Baltimore excellent field position. Special teams ace Sherrick McManis got injured early in the game and did not return. The Bears said it was a hamstring injury, and we can only hope it’s not serious. Running back/special teamer Benny Cunningham also left the game with a hamstring issue.